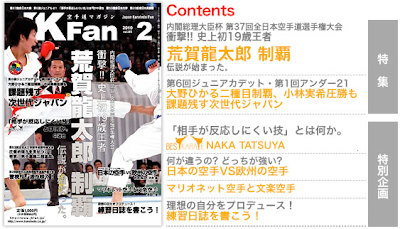 This month's Richard Sensei's corner article is about what surprised me about Japanese karate when I first came to Japan. Really, I could write a long, thick book about this topic! My interview this month is with World Karate Federation President Mr. Antonio Espinós. A variety of things have impressed and surprised me about Japanese karate since I first came to Japan in 1993. At one dojo I first went to, there was a peculiar salaryman who came to the dojo only holding a thin leather briefcase. Where was his karate bag I thought? Non-Japanese normally have large bags full of training gear. I wondered if he was a karate uniform salesman? When he opened his briefcase I peeked inside expecting to see karate catalogues, but instead there was a karate uniform folded flat, a tattered black belt, and two kumite mitts. That's it, nothing else! In terms of comparing the Karate between Japanese dojos and overseas dojos, it depends on the instructor. Many overseas dojos operate very closely to common Japanese dojos, using Japanese commands and proper etiquette. But sometimes an overseas dojo can almost be too serious, like it's pretending to be in feudal Japan, and this can even surprise Japanese visitors. Well-organized Japanese tournaments were a real eye-opener compared to tournaments overseas. Tournaments here normally finish on time with few hiccups, but in many countries tournaments still do go until 9pm at night, with both judges and athletes getting tired. So it was wonderful to see tournaments here put through 500, 800, even over 1000 competitors in a single day, yet be finished before 6pm. It's also impressive in Japan how the competitors, instructors and parents of the same dojo arrive early to get spectator seats, have a morning meeting, do a group warm-up, and then the competitors help each other all day. Where I’m from only some dojos work together this well, because normally competitors stay at a tournament just when their divisions are held. Lastly, I was astounded at how vast the Japanese karate community is. In addition to the private dojos, there are federations for schools, cities, styles, prefectures, universities, workers and so on. This web of inter-connected Karate worlds doesn't exist overseas. Dojos normally belong to a national style association (sometimes connected to Japan), and a national all-style federation through a regional federation only. So it is very enjoyable for non-Japanese in Japan to peel back the Japanese Karate layers like an onion. Japan is commonly called the ''Mecca of Karate'', the original center of the Karate world because here it is uniquely, sometimes mysteriously, mixed together!